Got something special, we can help design and manufacture it; we work to do it all. For over 25 years we’ve been able to provide beginners as well as experienced self-publishers with affordable high quality book printing.? Honest up-front pricing with no hidden cost, delivered to your door and no surprises; guaranteed. When you print with Amica, the final result will be precise to the specifications found in your quotation, manufactured with the best equipment and technology, using only the highest quality materials. Helping Independent Authors and Publishers Since 1990. Whether you are new to self-publishing or a veteran, Amica will provide you with books you can be proud of. Amica is unlike others in the industry. Our staff will help and assist you every step of the way. Assist with social media, bookstore list, online selling and major distributors. ALLOW US TO HELP YOU WITH YOUR BOOK PRINTING PROJECT. HIGHEST QUALITY, LOWEST COSTS BOOK PRINTING PRICES. Publishers love Amica’s affordable book printing prices. Our volume paper buying allows us to purchase paper in bulk then pass those savings to you; the customer. By using efficient book printing processing systems, automation that cuts out the excess, we are able to offer cost effective manufacturing prices for even the most demanding book printing project. When it comes to getting your book printed, you want to make sure you pick Amica, because we specialize in assisting and helping self-publishers every step of the way. The trim sizes for children’s books tend to vary more than most books, so we custom quote your book, every trim sizes is available to cater specifically to your needs. We also put smythe-sewn bindings on all our books to create sturdier, longer-lasting books. And, of course, a gloss finish is always recommended for the cover, which will give the books a longer life! CMYK colors work especially well to create vibrant colorful images for the children and provide a truly superior children’s book. We can also apply a number of finishes to make your book even more extraordinary, including spot finishes, foils, embossing, ribbon markers, and special colored endsheets. Children’s books are often judged by their cover; a printing company is judged by their printing quality, which we pride ourselves on. From unusual sizes and non-standard binding, to add details like ribbon markers, CD and DVD replication with insertion pockets and foil stamping, we are the printer who can make value added feature a reality with cost savings. Some books just need that little something extra, a value added item to make it stand out from the rest. From opulent cover finishes to those unique touches on colored end sheets, we can make sure your book stands out from the crowd. Embossing is the creation of an impression of some kind of design, decoration, lettering or pattern on another surface like paper, cloth, where engraving, plates are pressed against the surface to leave an imprint. Headbands/Footbands, these are narrow strips of cloth either sewn or glued to the top (headband) or the bottom (footband) of the book’s spine to add a distinctive finishing touches. Foil Stamping is the application of metallic or pigmented foil on to a solid surface by application of a heated die onto foil, making it permanently adhere to the surface below leaving the design of the dye.Colored End Sheets, add a pop of color with end sheets (the first and last pages of the book) in a vibrant hue, using a heavier paper stock adds strength to your book. French Flaps, similar to a dust jacket, but for softcover books, French flaps are a great place to include praise for your work and add value to the finish product. Self-publishing has seen extraordinary growth over the last twenty-five years, today there is no need to spend thousands of dollars on publishing packages, just do-it-yourself. Amica will transfer our book printing knowledge to you along with our self publishing experience to save you money. We have dedicated customer service phone support specialist to help answer any questions you might have about book publishing and getting your book printed and move it to the market place. We have been printing books since 1990, so you can trust our experience in the industry to carry out your book printing quickly and efficiently. Throughout these years, we have concentrated on three things: straightforward customer service, outstanding quality, and unsurpassed value for your money; our customers admire us for all three. We can offer a broader range of self-publishing capabilities and the best. From Warehousing to Book Distribution to Expanded Distribution and Online Retailers our vast experience with distributor networks ensures your book can get out to readers. From wholesalers such as Amazon, Ingram and Baker & Taylor, any independent bookstore can order your book through these wholesalers. If you have any questions about distribution, working with Amazon or Costco, please feel free to reach out to us, we can help and guide you through the process. Working with AMICA you’ll have everything you need to manage your book’s success. From our production and design departments to our printing coordinators, we’ll help verify specifications, supervise the shipping of your books, and resolve any challenges that may come up. We offer some additional printing services such as: file review, preflight and fixing, proofs, barcode creation, book cover design templates, free shipping and different book print production times and services to meet your deadlines. We love engaging with authors and listening to how we can make their passions come to life on paper. Imagining a new innovative idea, we can always accommodate your custom request; just contact us for a quote! Feel free call us at 1-800-622-9256 if you have any questions. 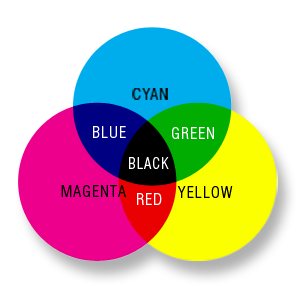 The project would be broken down into the primary printing colors; cyan, magenta, yellow and black (CMYK). Thanks to computers this process has become much easier. The image is broken down into these four colors and four separate plates are made. A plate is made up of areas that are receptive to grease and areas that are receptive to water. The areas receptive to grease hold onto the ink while the other areas attract water and repel the ink. These plates are then put on to a press. From the ink fountains, the press pulls in the ink and puts it onto the plate. The press applies great pressure to the plate and the ink imprints the image from the plate onto a rubber blanket. The image is then pressed onto the paper off the blanket to make a print. When these four colors are printed onto each other the image comes back together and looks the way it did in the native files or PDF. All this happens really fast and many impressions can be made from one set of plates. It is a very efficient process and lends itself very well to long runs over a long period of time. Tomorrow’s Technology is here Today. Prepress is the process of preparing digital files for a printing press —making them ready for printing. 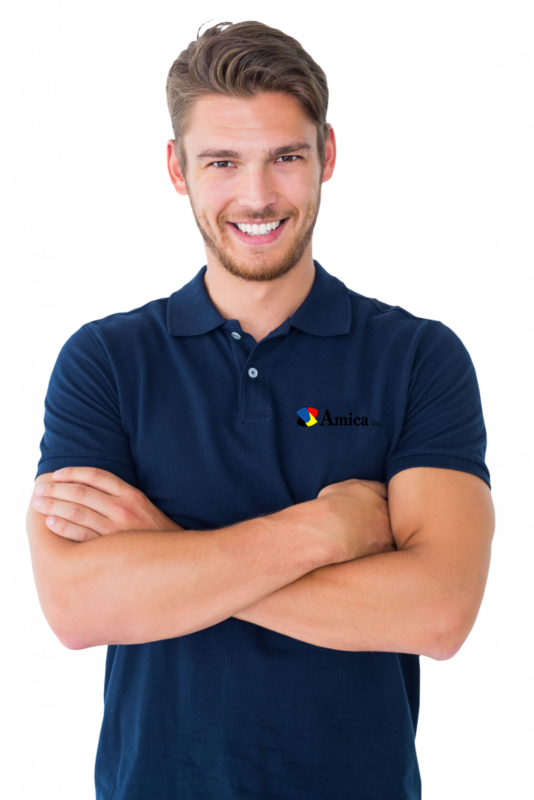 Upon receiving your files Amica’s prepress departments will review the electronic files and make adjustments to them to make them compatible with printing on paper or other substrates. Some of the typical prepress tasks can be performed by the graphic artist or designer who designed the project, but this isn’t required. Graphic artists usually apply crop marks and convert the color of modes of their photos to anticipate any color shifts, but much of the prepress process is handled by our experienced operators using proprietary software that is customized to Amica’s pecific requirements. An offset press does a lot of things in a very short amount of time to properly execute high-quality printing. Sheet fed offset presses are just that — printed sheet by sheet — and are more suitable for runs (1000 to 50,000). Regardless of the paper feed type, once it is loaded on the press it passes under a series of rollers, two of which work together to put the printed impression on the paper. Before that happens, ink and water are applied to the printing plate, which itself is mounted on a roller. The ink binds to the part of the plate that contains design elements; the water is applied to the white space portion of the paper. Oil is mixed with the ink to ensure that the ink and water repel each other and there is no smearing or blotchiness on the finished product. The plate cylinder transfers, or offsets, the design onto a rubber blanket roller, which in turn transfers the design onto the paper. In four-color printing, this process is repeated three times (once for each color) before the printing is complete and the job is ready for finishing. Often, the wet paper is run through an oven to dry. Depending on what you are printing, you might require finishing services such as binding and cutting. After your job is off the press, it will be put on another machine to be stitched and finally, it will be cut to size and packaged for shipment. Get in touch with us! Get in touch today for your FREE CONSULTATION or QUOTATION!